62304 Sandettie Lightship No recent reports. 62305 Greenwich Lightship No recent reports. 62103 Channel Lightship No recent reports. 62164 Anasuria AWS No recent reports. 62166 Thames No recent reports. 62147 Galaxy 111 No recent reports. 63105 Brent "B" AWS No recent reports. 62142 North Sea No recent reports. 62145 North Sea No recent reports. 62144 Clipper AWS No recent reports. 63110 Beryl A AWS No recent reports. 63113 Brent "A" AWS No recent reports. 63104 North Sea No recent reports. 63112 North Sea No recent reports. 63117 North Sea No recent reports. 62091 M2-20 NM E Lambay No recent reports. 62094 M5-SE No recent reports. 62092 M3-SW Mizen Head No recent reports. 62090 M1-W Aran Isld No recent reports. 62093 M4-Donegal Bay No recent reports. 62303 Pembroke Buoy No recent reports. 62107 Sevenstones No recent reports. 62114 North Sea No recent reports. 62301 Aberporth Buoy No recent reports. 64046 K7 Buoy No recent reports. 62125 Station 62125 No recent reports. 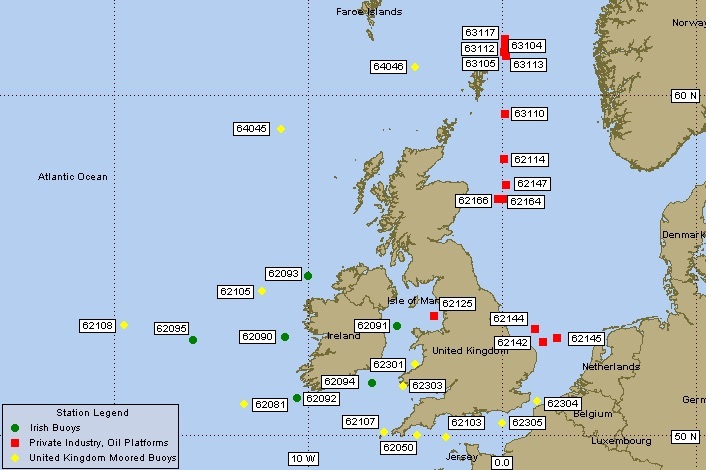 62081 K2 Buoy No recent reports. 62105 K4 Buoy No recent reports. 64045 K5 Buoy No recent reports.